(Editor’s note: We’re really cruising now! Last updated dispatch from January, and I’ve closed the gap to a few months… whew… I promise we’ll be current soon. Enjoy the dispatch below from January 30, 2014. Alanna Rich of the Long Island Buying Club is rich indeed in the variety even an islander can enjoy from producers here in Maine! The photo above, shared with us by Alanna Rich of Long Island, Maine, beautifully illustrates our raison d’etre. Fresh locally grown and produced food, year round in Maine. 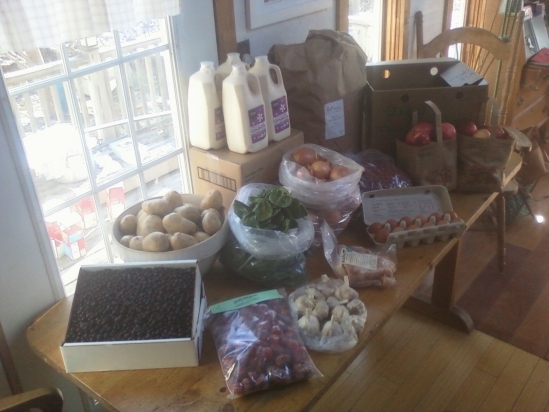 Although getting this food to Maine islands is a particularly pleasing accomplishment for me, personally, Alanna’s midwinter array isn’t merely the work of successful food distribution. It is the steady braiding together of products, people, geography, economics, and our current reality. Like a braid, these strands are not manufactured materials to assemble in the desired fashion – they are attached to something rather special on the other end – your communities, your fields, your neighbors, your children’s dinners (even the molecular composition of these things, too – if you want to go that far)…. You can see how the braid draws in the rest of what is important to us. That’s why it’s not simply that local food is important. Food is the braid, local is the source of the strands we attempt to gather into a manageable fashion without losing personality, style, charm, vitality. You probably saw in last week’s email I chopped off about 7 inches of red headed madness. Phew. Now my locks can be stuffed under a hat, don’t require the maintenance, rarely tangle, and (to my mind most importantly) are not a literal pain in the neck! When it comes to food (and I realize this metaphor is subliminally mixing hair and food, so you’ll have to rise above that particular subtext) we might look at it another way. Yes, our food system needs to be redesigned. Yes, our mainstream food supply is full of split ends and bad ‘do’s’. As we untangle the mess, though, (and yes, I am talking about Farm Bills, and Grange Future, and Co-ops, and investments in local agriculture -the whole shebang) we’re going to have to remember that what we chop is also connected to living organisms – and so, we must chop wisely. I wanted to go shorter. On the haircut. Louise, for those of you who missed this fact, is a superwoman logistician. Complete with pedestrian alter ego. When she’s not routing together Maine’s far-flung places with customers statewide, she also happens to be an exceptional hairstylist, and has a fair degree of insight into chopper’s remorse. So if truck drivers can cut hair with a vision, and food can be delivered with a sense of style, so can policy can be crafted with respect to the living beings attached to its matter. We might not love all components of this year’s farm bill, or rue that some items are still missing from our winter tables, but let’s keep at it. Alanna’s table is braided together with every item you order. So is mine, and the 200 producers we work for.